The conformation of the skeleton is, in addition, a segment of the pigeon to which, in the past, too much consideration has been paid. Selecting according to skeleton meant a negative decision in relation to speed. Nevertheless, there is a congregation of fanciers who keep the faith insisting that to fly the difficult races you need a pigeon with a powerful bone structure and strong, tight fitting vent bones. This isn't factual. 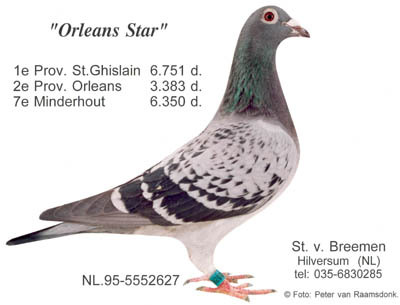 "Orleans Star" is the nestsister of "De Jonge Baron" out of "De Zwarte Baron"(Grandson "Het Boerke") and "Yearlings Blue Lady" out of "De Goede Jaarling". She won 1th Provincial St. Ghislain 6751 birds and 2nd Provincial Orleans 3383 birds as a youngster. She also proved to be an excellent breeder. Pigeons with thick bones, so abundant that you have to cut off the rings when they get old, are pigeons from the 1930's: heavy duty, but slow pigeons. Today's leading racing pigeons has a much finer bone structure than the earlier breeds. It is incorrect, simply, to assume that there's an intimate relationship between a fine built bird and the capacity to race well. At the same time, you're misdirected, as well, when you believe that with a strapping bone structure the capacity to win diminishes. When examining a very finely built bird, don't automatically imagine you're occupying yourself with a first class pigeon. In our opinion, there is absolutely no linkage between the thickness of the bone structure and the capacity to race. Except it does happen that a very heavy bone structure become an extra burden on difficult races. Yes, I do conceive so! !